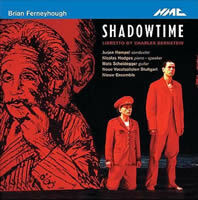 Brian FERNEYHOUGH: Shadowtime (2003-4). Nicolas Hodges (pno, spkr), Mats Scheidegger (guit), Neue Vocalsolisten Stuttgart, Nieuw Ensemble, Jurjen Hempel (cond.). NMC D123 (http://www.nmcrec.co.uk/). Distributed in the US by Qualiton (http://www.qualiton.com/). Compared to his previous compositions, Ferneyhough’s Shadowtime is easy going. It’s almost as if his California tenure exposed him too thoroughly to Desperate Housewives and American Idol. A “thought opera” based on the life and work of philosopher-critic Walter Benjamin, the piece swirls “the intertwined natures of history, time, transience, timelessness, language and melancholy.” There are no standout singing roles. Like the Nieuw Ensemble players and the two instrumental soloists, the Neue Vocalsolisten Stuttgart’s members come and go, taking briefly named parts among the constantly spiky and fluctuating texture. This quasi-opera unfolds briskly through seven asymmetrical scenes (several can be played alone). The first layers events in Benjamin’s life. The purely instrumental second scene, “Les Froissements d’Ailes de Gabriel,” could be a guitar concerto. Scene III, “The Doctrine of Similarity,” brings back the chorus in 13 successive canons with wide-ranging texts. This being typical Ferneyhough, it’s nearly impossible for the listener to detect imitation. Las Vegas is the setting for Scene IV, “Opus Contra Naturam (Descent of Benjamin into the Underworld),” for a continuously prattling solo pianist. Scenes V and VI bring back the singers and the barest semblance of plot. Instruments vanish from the concluding scene which adds tape to the chorus. The last sounds are the composer’s own voice reciting nonsense. Having previously dismissed opera as a “grubby medium,” Ferneyhough’s unconventional dip in the genre he disparages tackles a philosopher’s thoughts and history, cramming various contents and moods into two hours. Even without a linear plot, there is much captivating “action” as the landscape and ensembles range about wildly. This remains, withal, Ferneyhough-lite: The set pieces do not sound as gruelling as the exemplarily complex Third or Fourth String Quartets or any of the Carceri bits. It might be instructive to hear the “guitar concertino” alongside Kurze Schatten II, seven movements for solo guitar also based on Benjamin’s writings. While there is nothing essentially wrong with Ferneyhough penning something ostensibly easier to assemble and perform, fanatics expecting a time and motion study may be disappointed. Were Shadowtime to have someone else’s name appended to it, it might fairly be characterized as pretentious drivel, e.g., Scene VII’s title: “Stelae for Failed Time (Solo for Melancholia as the Angel of History).” Indeed, Hodges’ solo, the work’s “pivotal scene,” actually sounds more like mid-’60s aleatoric doodling. Possibly the pianist’s joy in calisthenics detracts from the composer’s aims. Even Charles Bernstein’s libretto leans more toward witticisms than erudition. There is good music here but, in what we’ve come to recognize as Ferneyhough’s terms, it’s rather cuter than complex. Now in its third incarnation, Maconie’s exploration of all things Stockhausen is a winner. While Maconie’s first two Stockhausen books (The Works of Karlheinz Stockhausen, Clarendon Press, 1990; The Works of Karlheniz Stockhausen, Marion Boyars, 1976) read rather like fawning liner notes, this new book offers greater nuance and — delightfully — earnest criticism. In the last 100-plus pages, Maconie details the all-consuming, almost complete Licht. In discussing other works, he detects influences and makes connections. You may not see Stockhausen at the hub of 20th-century music’s wheel and, while it’s debatable whether Maconie actually believes this, there are remarkably few composers or influences Maconie doesn’t incorporate. The author’s coverage of Refrain (1959) makes clear that new material reconsiders the old, placing the “ancient” piece in historical context and assessing how its sound world has fared. Maconie critiques Stockhausen’s 2000 recording of the piece, demonstrating a critical capacity absent in the previous tomes. Unfortunately, Other Planets contains fewer musical examples. Gone are Refrain’s semicircular staves in both earlier editions. Maconie’s newest discussion of the early piano pieces is especially disadvantaged without examples, especially as both the 1976 and 1990 volumes included Klavierstücke I’s first page and all of III. To compensate, Maconie inspects the music from a higher altitude, taking in others’ analyses and work. It may not have been easy to talk of Stockhausen and Cage in the same breath in 1976, but Maconie does so now in apparent comfort. I’m determined to keep all three editions. Maconie has done amazing work. If anyone gets Stockhausen the attention he merits, it will be this author. At mid-century, Stockhausen was influential. During the last two decades, however, his presence has diminished. Sure, the aura persists, but like the rather more extreme Sorabji and Pettersson, if he occupies the thought of listeners at all, he’s perceived as crazy or, worse, dead. If I’m wrong, well then, someone please show me the evidence. To repeat what I said years ago, the man’s huge ego and tight-fisted control alienates a potential North American audience. Stockhausen’s CDs can be ordered direct from the source, Stockhausen-Verlag (http://www.stockhausen.org/) or in the US from CDemusic (http://www.cdemusic.org/). As curious as I am to get ahold of CD 3, with its two early electronic studies and Gesang der Jünglinge, paying US $40-plus for one disc is equally nuts. (The weak dollar isn’t the composer’s fault.) I’m not disrespecting Stockhausen’s need to release his music as he desires, nor am I dismissing the production costs of the accompanying 180-page book (so advertises the website). It’s a practical matter. Stockhausen has priced himself into a distant corner. Ever a scavenger, I found a used copy of CD 13 with Kurzwellen of 1968. (I can see Karlheinz’s agents fanning out from Kürten, seeking the offender who unloaded so precious a product!) The pressing features an April 9, 1969 WDR taping with Aloys Kontarsky, Harald Bojé, Alfred Alings, Rolf Gehlhaar, Johannes G. Fritsch and the composer at the controls. It’s a straightforward package with a 20-page booklet printed in blueprint-blue ink, several black-and-white photos, and Stockhausen’s multicolored cover graphic. By chance, I stumbled upon a Finnadar LP (SR 9009) with The Negative Band (Michael Fink, Earl Howard, Denman Maroney, David Simmons, John Paul Taylor, Jonathan Weisberger) performing Kurzwellen and the improvisatory Set Sail for the Sun. Differences, some intentional, others inevitable, are revealing. The Negative Band’s Kurzwellen, taped May 29, 1974, substitutes alto saxophone for viola, a Buchla 100 for Electronium, and AM/FM for shortwave. It’s not just because of the sax, but the Americans’ rendition is jazzier and less attentive to the work’s live-radio aspect. Then again, any European shortwave set will automatically provide greater variety. Absent Stockhausen’s firm hand, the work lapses into a forgettable free-jazz session. The composer’s vigilance is fully justified. Stockhausen’s imprint on his troupe produces a narrowly evolved set of responses by musicians listening to rather than upstaging one another. CDemusic sells Stockhausen-Verlag’s Hymnen (1966-67) in two versions on four discs for $110. I was fortunate to locate a library that would lend me its collectible DG LPs (2707 039). Internet prices for this double-album set start at $250! I jury-rigged my turntable to my computer. Forty years on, scratches and all, this was a mighty fine way to savor an electronic masterpiece. Stockhausen would probably not want me to hear the flutter and sputtering, and I could probably benefit from his lengthy notes. But if Stockhausen likes his fortress impenetrable, then I’m afraid I’ll remain on the wrong side of the moat. Stockhausen-Verlag ought to settle on a loss leader by pressing a few thousand copies of a representative CD, something with electronics and live instruments, preferably from the last decade, prune the booklet, fashion a sampler, and distribute the lot for €10 or less. If the composer autographed an edition of 500 at €20, I’d be all over it. 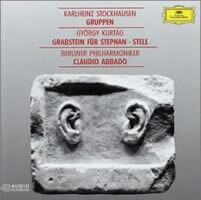 Karlheinz STOCKHAUSEN: Gruppen (1955-57); Punkte (1952/62, rev. 1994). WDR Sinfonieorchester Köln, Arturo Tamayo, Peter Eötvös, Jacques Mercier. BMC CD 117 (http://www.bmcrecords.hu/). Distributed in the US by Forte (http://www.fortedistribution.com/). “Leaving Home: Orchestral Music in the 20th Century.” Episode 6: “After the Wake.” Arthaus Musik 102 043 (http://arthaus-musik.com/). Distributed in the US by Naxos (http://www.naxos.com/). Special feature includes filmed concert of Gruppen with the City of Birmingham Symphony Orchestra, Simon Rattle, John Carewe and Daniel Harding, conds. Eötvös leads a taut and deferential crew through 24:30 of steely organized chaos. Back in the day, Eötvös, who toured with Stockhausen, had an affinity for this music. However, Abbado’s slightly faster 1996 DG recording is more liquid, and the work’s spatial layers more readily apparent (22:20 on DG 447 761-2 with co-conductors Friedrich Goldmann and Marcus Creed leading the Berliner Philharmonic). It’s reasonable to characterize Abbado’s Gruppen as more French (or Boulezian! ), whereas Eötvös’ reading is the more Teutonic (read: staid). Perhaps an impassive sheen befits the work. Eötvös should know. Abbado’s tragic conclusion reminds this listener of a guttering candle’s final moment. 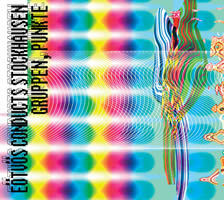 With its three orchestras and abounding complexities, Gruppen cries out for visuals. The special feature attached to one of Simon Rattle’s music documentaries realizes the need. “After the Wake” shuffles through post-WWII concerns (featuring music by Schoenberg, Strauss, Stravinsky and Britten), with the filmed concert of Gruppen as a fitting bonus. Each orchestra wears a different color (blue, red, green; conductors in gray). At approximately 21 minutes, the work is most engaging when the viewer is able to follow one conductor’s beat and identify the music aligning with it. Judit Kele’s “The Seventh Door” (Juxtapositions DVD9DS16) has footage of Eötvös, Boulez and David Robertson rehearsing Gruppen, providing some insight (Boulez making a rare mistake) into the work’s mechanics. I’ve never been able to follow the Gruppen train. It’s cantankerous, rich, and, in my opinion, needlessly complicated. I prefer the single orchestra Punkte with its ribbon-like starts and stops. Here Eötvös and the WDR sound as if they’re enjoying themselves. BMC’s Punkte, dating from 2004, could be identical to a release on Stockhausen-Verlag CD 81. On June 8, 2004, Eötvös conducted the WDR Sinfonieorchester in Punkte twice. Stockhausen attended and spoke about the work between performances. Stockhausen-Verlag contains these remarks, along with a later taping of an English translation on CD 81. Eötvös’ website indicates the Verlag’s timings, which are identical to BMC’s. Abbado’s DG recording pads Gruppen with two Kurtág pieces: Grabstein für Stephan, Op. 15c (1989) and Stele, Op. 33 (1994). Grabstein für Stephan memorializes the husband of Marianne Stein, a psychologist who helped Kurtág through an intense period of self-discovery. Here I must repeat that I find Kurtág a far more satisfying composer. As a curious discrepancy, according to Paul Griffiths’ DG notes, Kurtág was at Gruppen’s premiere, whereas BMC’s Richard Toop states otherwise. Another work to pair with Gruppen would be Goeyvaerts’ Zomerspelen (“Summer Games,” 1961, rev. ’69) for three orchestral groups (Megadisc MDC 7829/30, The BRT [Belgian Radio and Television] Symphonic Orchestra conducted by Gianpiero Taverna). 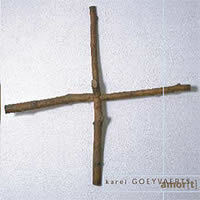 “Direct and impressionistic” music is how Goeyvaerts characterized this 11-minute, three-movement piece. Originally containing aleatoric and improvisatory sections, the composer replaced them with notated passages in 1969. An underappreciated Darmstadt figure, Goeyvaerts had to have been aware of Gruppen. His less chaotic three-orchestra piece employs gestures that recall Webern and Debussy.